J.K. Rowling Is Writing 2 New Books, Is One of Them Harry Potter? 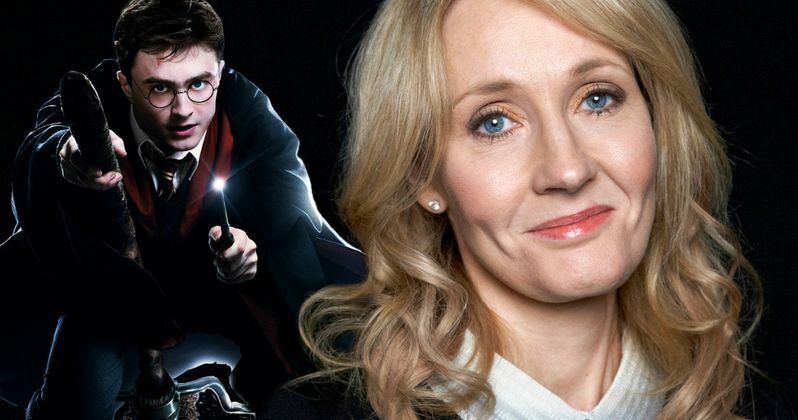 Harry Potter creator J.K. Rowling has already had quite the huge year, with the debut of her new play Harry Potter and the Cursed Child, and the new Harry Potter theatrical spin-off Fantastic Beasts and Where to Find Them. Both of these productions have been critical and financial hits, with Fantastic Beasts recently passing $200 million domestic and $720 million worldwide, from a $180 million budget, while it was also recently announced that Harry Potter and the Cursed Child will be coming across the pond to Broadway in 2018. Earlier today, the author confirmed through social media that she's currently hard at work on two new novels, although details on both books are scant, at best. The author made the revelation on Twitter this morning, adding that she was writing one novel under her real name, and another under her pen name Robert Galbraith. Under the Robert Galbraith pen name, she has written three books in what is called the Cormoran Strike series, 2013's The Cuckoo's Calling, 2014's The Silkworm and last year's Career of Evil. No details have been given for the Robert Galbraith novel, but as for the other book, she shot down an eager fan's theory that the other book would center on Newt Scamander. Here's what she had to say to this fan on Twitter earlier today. "No, no, no. There won't be Newt Scamander novels. Only movies. Calm down, there!" Back in October, just a month before the first Fantastic Beasts movie hit theaters, the author confirmed that there will actually be five Fantastic Beats and Where to Find Them movies, instead of the trilogy that was originally planned. It was also confirmed that Johnny Depp is playing the dark wizard Gellert Grindelwald, who was first introduced in Fantastic Beasts and Where to Find Them. The movie sequel has been set for release on November 16, 2018, although no release dates have been given for the third, fourth and fifth movies in this series. While Newt's story will be told over the next few years on the big screen, it seems we won't get to see any more stories in print, at least not yet. Back in September, J.K. Rowling also released three short story collections set within the Harry Potter universe, so it's possible that this new novel she's working on, aside from the Robert Galbraith book, is completely unrelated to the Harry Potter universe. She also published the 2012 novel The Casual Vacancy, which was adapted into a three-part miniseries that debuted on HBO last spring. It's possible that the author is working on a completely original, non-Harry Potter story, but it remains to be seen when she will reveal more about these books. The author also shed some light on her incredible work ethic, revealing that her series of tweets was part of her writing break, because she had been writing non-stop since 5:55 AM this morning. She also revealed during her writing break that she isn't sure if the Robert Galbraith novel or the mysterious J.K. Rowling novel, which may or may not be a Harry Potter story, will be released first, but she promised to reveal more details when the time is right. Take a look at the series of tweets from J.K. Rowling earlier today, as we wait for more from J.K. Rowling and the Harry Potter Universe.